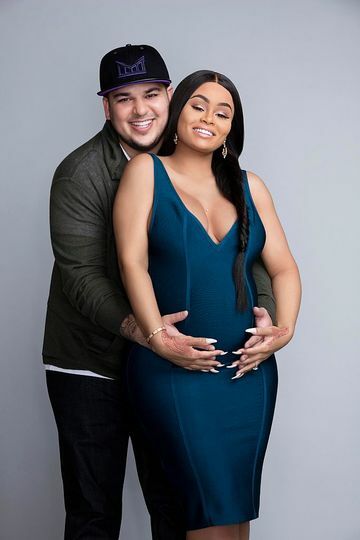 The soon-to-be Kardashian (and mom) Blac Chyna has a more "educated" approach to her second pregnancy—and for the reality star, that means she'll consume her own placenta. Looks like the future Mrs. Kardashian will follow in the footsteps of her famous sisters-in-law! As we've previously reported, both Kim Kardashian West and Kourtney Kardashian have been candid about their decisions to eat their own placenta after giving birth—and now Blac Chyna has shared that she too will chow down on the stuff. Blac appeared on her best friend's podcast, Loveline with Amber Rose, where she discussed the philosophy behind her decision. Blac, who is expecting a daughter and has a three-year-old son, opened up about the major difference between this pregnancy and her first. "I feel like with my second baby, I’m more educated than the first one," Blac said. "Just reading and knowing the pros of breastfeeding for your baby, and just recently I found out some new, cool stuff about not cutting the cord and sending your placenta; you can get these pills to take them after to make you and the baby healthy." It turns out fiancé Rob Kardashian's sisters aren't Blac's only inspiration behind her choice to eat her own placenta. "If you notice dogs and cats, when they have their babies, they eat the placenta," she said. "You're like, 'No, don't do that!' But they do, it's a healthy thing." Advocates of the practice rave about placenta's ability to increase milk supply, ward off postpartum depression and boost energy, though scientists say there are no proven benefits. While consumption of placenta (in pill form) is nothing new, here's something that is: Umbilical cord art, which is gaining popularity. It's exactly what it sounds like: The practice of manipulating the cord to create artistic images. While Blac didn't weigh in on this new trend, plenty of moms out there are embracing it. Need proof? See below. What do you think of all this? Have you ever eaten your own placenta? Do you have any desire to make umbilical cord art?